Forget The “Touch It Once” Rule! The “touch it once” rule has long been the golden rule of paperwork. The idea is that when you pick up a piece of paper, you should immediately handle whatever action is associated with it. This keeps you shuffling through the same stack of paper over and over again which saves a tremendous amount of time. This rule work very well for some people, and if it works for you that is wonderful. However, for many of us it creates anxiety every time the mail man arrives or another item is placed in our inbox. What if one of those pieces of paper is something time consuming? How can I plan my day when I don’t know how much time I will need to handle my paper? The result is often the opposite of what the rule is intended to do: We stop checking our mail or our inbox because we don’t have time to process all of the paper and therefore don’t want to touch any of it. I hereby give you permission to forget the “touch it once” rule. I have eliminated it from my routine and my paper management routines have improved because of it. However, I have a new rule for you. I PROMISE that this one is not as tough to follow as “touch it once,” and it will make your paperwork processing infinitely better. That rule is this: Every time you touch it, move it forward. Did you just check your mail? 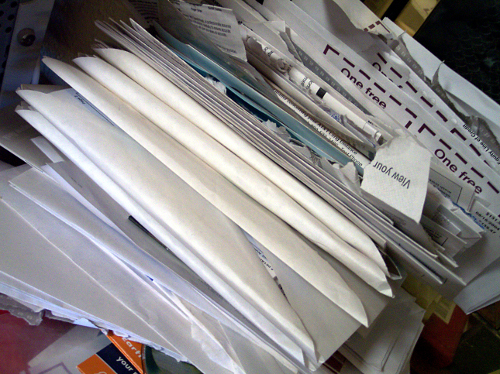 Move it forward by sorting it and immediately recycling any unwanted junk mail. Is sorting your mail daily too much? Then just eliminate the unwanted junk mail immediately and place the rest in your inbox to be sorted later. The beauty of the rule is that each step can be as big or as small as you want it to be, so long as you continue to move each item forward. Develop routines around this rule so that you always know what the next step is for routine items like bills or bank statements. If you sort your mail and other paper into categories, purchase a vertical sorter to make sorting and finding the documents you need easier. Finally, don’t be afraid to change your routines until you find something that works for you. Just remember: Every time you touch it, move it forward! I have a system that is very much like the ” Every time you touch it, move it forward”. I have 1 folder of extremely important things that need timely attention. That folder happens to go with me everywhere I go. In the folder, I am constantly sorting through important bills, adding recently recd bills, and so on. Every time I go through that folder, yes I am sifting through the same things over and over again, but at the same time, I’m moving the next thing that needs attention to the front and prioritizing everything in there. When my husband asks what bills are due next and what I just paid, I can tell him because the information is always at hand, or I just know because I have touched it so many times. It is an amazing system and is not time consuming. I can go through all of our bills each week in about 10 minutes or less. =) GREAT IDEA! !